If you ask anyone in or outside Canada what makes that country different from other nations, it doesn’t usually take long for hockey to emerge as something that seems characteristically Canadian. Canada’s greatest and most wide reaching export, hockey cannot be ignored in Canada, whether one appreciates the game or not. There are outdoor and indoor rinks in every community across the country; there is year-round media coverage of hockey; most Canadians alive at the time can tell you where they were when Paul Henderson scored the winning goal to beat Russia in the Canada/Soviet series; a hockey scene figures prominently on the back of the five-dollar bill; and, when asked in 2004 to come up with a list of the ten greatest Canadians of all time, millions of Canadians polled put both Wayne Gretzky and Don Cherry in the top 10. “Hockey,” writes novelist David Adams Richards, “is where we’ve gotten it right” (60). But how does hockey connect to Canada today? How can an extremely multicultural country that has long considered itself as a peacekeeping nation still see itself reflected in one of only two sports (the other is lacrosse, Canada’s official national summer sport) in which fighting is an accepted and even lauded part of the game? In his introduction to the tenth-anniversary edition of Hero of the Play, poet Richard Harrison discusses the origins of hockey. There has long been a debate over whether hockey first developed and was played in Windsor, Nova Scotia, Kingston, Ontario, or Montreal, Quebec. More recently, there appears to be strong evidence that hockey was played even earlier by sailors stranded in the Arctic as part of Franklin’s ill-fated expedition to discover the fabled Northwest Passage. “Hockey emerges in the Canadian past at the time the Canada we lived in then as separate communities was being made into Canada we live in now as a people. In mythic terms, hockey is one of the few things that could be said to be ours from the beginning of Canadian time. Hockey is, in writer Morley Callaghan’s words, “the game that makes a nation” just as much as it may be a game the nation made. Naturally, there is a lot at stake in Canada’s claim to be the “first nation of hockey,” to quote the rant from “Joe Canadian” in the 2000 beer commercial from Molson’s “I Am Canadian” campaign. You’ll see the words “it’s our game” in everything from commercials for beer and Tim Hortons to school textbooks. The notion that hockey and Canada are equal parts of one another helps advertisers, the sport of hockey in Canada, and broadcasters trying to increase their audience numbers. There is plenty of evidence, of course, to suggest that not only was hockey Canada’s game at its outset but that it also remains that way today. One need only look at the fact that over 500,000 children, women, and men are registered each year in organized hockey in Canada. At the professional level, Canadians still make up over 50% of players in the NHL, more than two and a half times the number of American players in the league. What makes that number even more extraordinary is that Canada has only one-tenth the population of the USA. Canada’s dominance in international competition over the years also supports this idea. While the men’s teams have won Olympic gold medals in 2002 and 2010, the women’s team has won gold in 2002, 2006, and 2010. The women’s team, along with that from the United States, have been so dominant in international play that there is pressure to have the sport removed from the Winter Olympics until players from other nations can catch up. 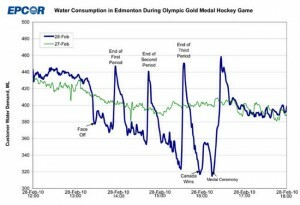 Television viewership of hockey in Canada also demonstrates Canada’s connection to the game. The 2010 Gold Medal game between the Men’s hockey teams from Canada and the United States was the most watched sports program in Canadian viewers, netting 13 million viewers at its peak. 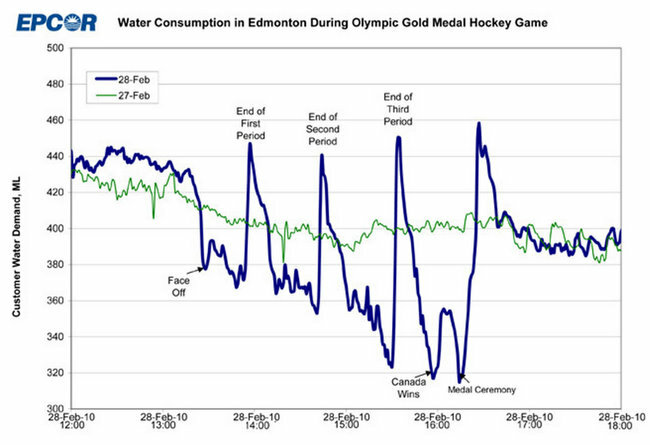 The following chart from the City of Edmonton’s water utility provides another way of demonstrating just how many people were watching the gold-medal game on February 28th. “Whatever the origins of Canada’s self-abasement, Peter Gzowski understood the syndrome in his 1982 book The Game of Our Lives. ‘We are not good with our heroes, we Canadians. Starved for figures of national interest, we, or our media, seek out anyone who shows a flicker of promise and shove them on to the nearest available pedestal. We leave them there for a while, and then we start to throw things at them'” (Dowbiggin 75-6). As Bruce Dowbiggin points out in The Meaning of Puck, one does not need to scratch far beneath the surface to see how Canada’s connection to hockey seems to reveal some strong contradictions about the country and the sport: “In its quick, brutal fashion, hockey is a perfect wedge in the emerging urban/suburban-rural split in Canada — the so-called Tim Hortons versus Starbucks. Hockey lovers regard urban Canadian culture as some extended episode of Queer Eye for the Straight Guy, a fashion/design industry that keeps Canada out of wars and in designer jeans. If Canada were a TV program, it would be The Odd Couple. Hockey is Oscar, lounging in his underwear in his a fraying BarcaLounger. The rest of Canada is Felix, asking ask Oscar to pick up his pizza boxes, put on a clean shirt and take the empties back to the beer store” (21). Although I would argue that Dowbiggin overstates this case – the lines between urban and rural Canadians are hardly as cut and dry as he proposes – it is important to remember that Canada is much larger than hockey; for all the Canadians obsessed with the game, there are just as many who focus on other parts of Canadian life, even if they do sometimes tune into the Stanley Cup Finals or the Olympic Gold Medal game. One of the most crucial differences of opinion among Canadians revolves around the role of fighting in hockey. Despite its well-deserved reputation in both World Wars as some of the fiercest troops on the battlefield, Canada has, over the last fifty years, become known around the world as a peacekeeping nation, a moderating force in international debate that sees war as the last and most unappealing option. My name is Caroline and I am from Sweden. I am writing an essay about Canadian Hockey, I found your website while i was searching for information. I was wondering if you also could send some information about how the Canadian people feels about the game and why it is such a big part of the Canadians life´s. How the Hockey belongs in their everyday life. I would appreciate that !